This book is a facsimile of The Tempest as it appeared in the first collected folio of Shakespeare’s Works, originally published in 1623. 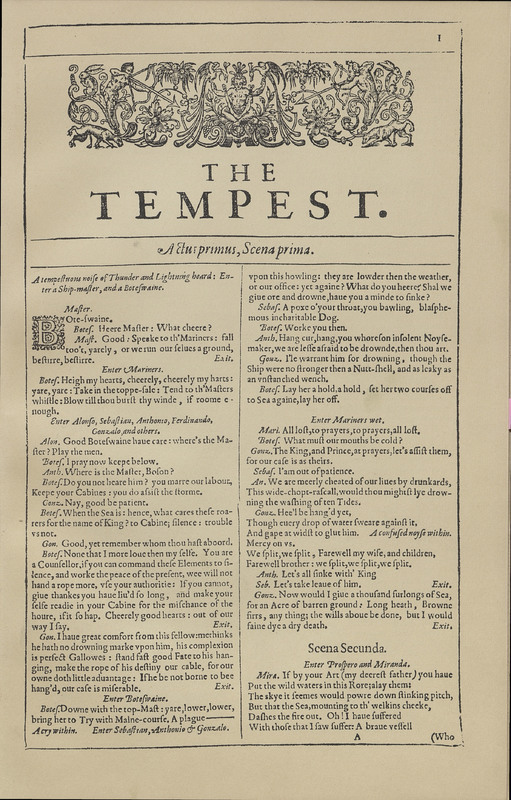 The Tempest is thought to have been written around 1611 and was first performed before King James I in November of that year. Shakespeare’s Tempest features a shipwreck caused by the rightful Duke of Milan and magician Prospero that strands his brother and the King of Naples on the island. Unlike the realism embraced by Daniel Defoe in Robinson Crusoe, Shakespeare populates his island with supernatural figures including the spirit Ariel and the witch Sycorax and her son, Caliban. The Tempest. Boston and New York: Houghton Mifflin, 1928.